Growing up, there was a place where my Dad played pool that boasted a large, murky glass jug filled with iridescent white orbs; you might call them pickled eggs. Something about their appearance on a bar top, poorly lit by the fluorescent lighting, made the act of eating them akin to sticking ones hand in fire: you just didn’t do it unless you were drunk and your friend dared you to. However, given a few decades between that memory and now, I probably wouldn’t have to be dared to eat them, and there’s a good chance I’d eat them sober too. My love of pickled food items has grown tremendously over the last 10 years. Partly because I’ve eaten some really, really good pickled items out at restaurants. Another part might have to do with my chunk of Scandinavian heritage. And partly because once you’ve eaten enough food your friends have dared you to eat while drinking, well, at some point you start to like it all. 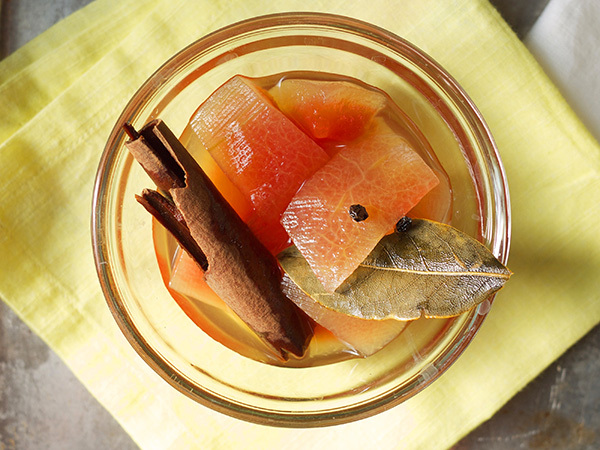 My introduction to pickled watermelon rinds did not, however, come at the tail-end of a deep Southern drinking spree. I was offered some from a friend, tried them, and liked them. And today, because I’ve been overindulging in the bounty that is summer watermelon, I decided to make up a batch from all those leftover rinds. I’m also including a complimentary cocktail to go along with your pickled watermelon. It too uses scraps in the form of ginger knobs (My freezer is full of tiny bits of ginger because I can never quite buy the right amount and cannot bring myself to throw away anything.). 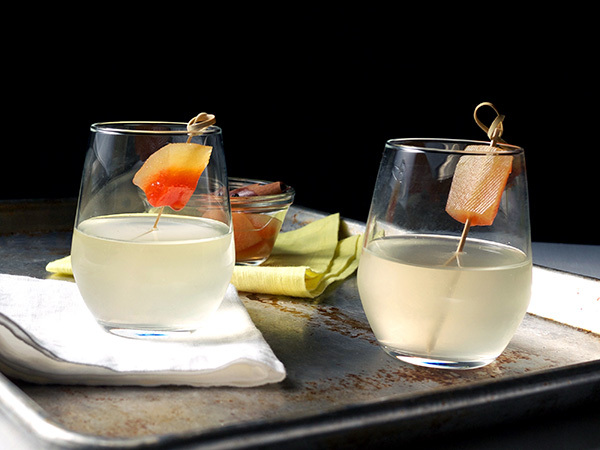 A tiny bit of the brine goes a long way to perk up the cocktail, so definitely make both! You’ll find that these tiny sweet and salty, slightly crunchy rinds are also a delicious bar snack to have around for the summer. And I’m sure any guests will appreciate these just a tad more than the jar of pickled eggs. 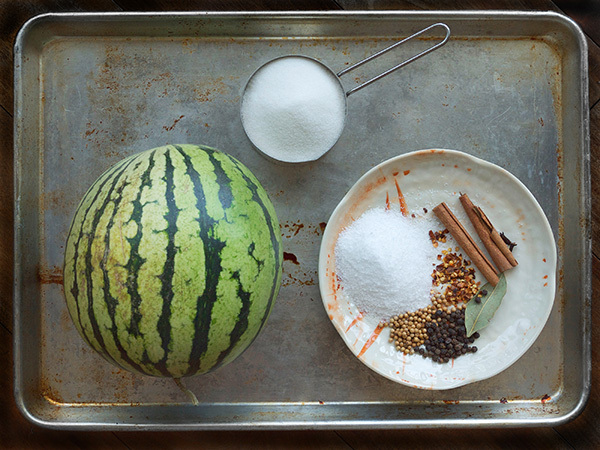 Using a vegetable peeler, remove outer green layer of skin from watermelon (if you have a smaller watermelon, cut the bottom and top ends off so you can stand your watermelon up to peel. If it’s larger, cut in half to stand up). Discard skin. Cut rind into 1-inch cubes and reserve pink flesh for another use. Combine apple cider vinegar, sugar, water, salt, cinnamon sticks, peppercorns, bay leaf, chili pepper flakes, cloves, and coriander seeds in a medium saucepan and bring to a boil. Add watermelon rind, return to a boil and boil for 10 minutes, stirring occasionally. Remove from heat and carefully place a heatproof plate on top of the rind to keep it submerged as the mixture comes to room temperature. Once cool, transfer entire mixture to an airtight container and let stand in refrigerator for at least 2 days and up to 2 weeks. Combine vodka and ginger in an airtight container. Let stand in a cool, dark place for 5 days or to your desired spiciness, up to 14 days total. Strain into an airtight container and store at room temperature for up to 6 months. 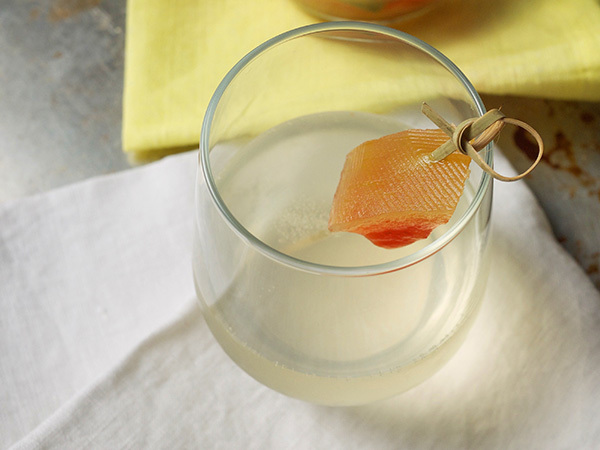 Combine Ginger Infused Vodka and vermouth in a mixing glass and fill two-thirds full with ice. Stir until well chilled, about 20 seconds. Strain into a small wine glass or coupe. 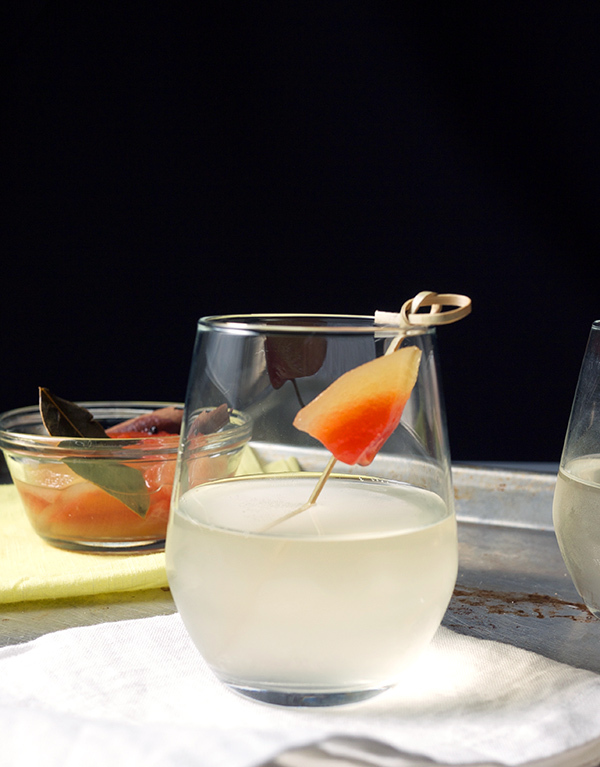 Top with Prosecco and garnish with the pickled watermelon rind.